Spent the day at home and had quite a few visitors which was lovely. The midwife also came to visit and there are a few concerns that The Little Miss is a bit slow to feed and has lost a bit too much weight, so we are busy feeding as much as possible. 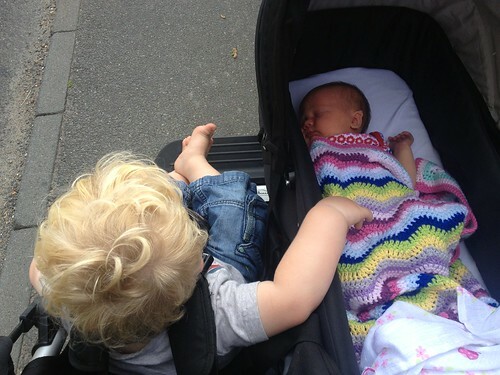 We took a short walk to a local garden centre to test drive the new double buggy. It made smile to see The Little Mister trying to hold The Little Miss’s hand on the way. Today we have had lots of visitors and it has been lovely, especially as so many of them have bought gorgeous presents for The Little Miss and The Little Mister. Several of them have also bought food and that is always welcome! I have taken so few photos today though that I have shamelessly nicked this one from my aunt who does the blipfoto daily. The Little Miss behaved beautifully for her and she had a lovely long cuddle. Good baby! I had a fairly dreadful night on the ward last night as it was noisy and busy, not through any fault of their own really but there was a lot of comings and goings. The Little Miss and I took it easy before leaving after lunch where I had a well needed nap and The Mister had some lovely cuddle time with his beautiful new daughter. I guess this is where we start to find out what life as a family of 4 looks like. Can’t be that hard can it? My sister copes! Well Monday morning did not start quite as planned. Having joked with my Dad and sister that I would probably give birth whilst they were on holiday, I wasn’t really expecting my waters to break bang on 37 weeks. In a weird sort of way I was quite worried that I was going to have the baby whilst they were away. I was so uncomfortable and really not enjoying the last stages of pregnancy. So, my waters broke at 8am (so much water she must have been swimming in there!) and The Little Mister went off to the childminder as usual and The Mister and I made our way to hospital arriving at about 9.15am. Rather like last time it would seem that my body is made to deliver babies swiftly and efficiently and by 10.13am our beautiful girl Eliza Gillian Mary made her appearance weighing in at a grand 7lbs 15.5oz. A perfect size but I am very, very glad that she did not make it to full term!!! 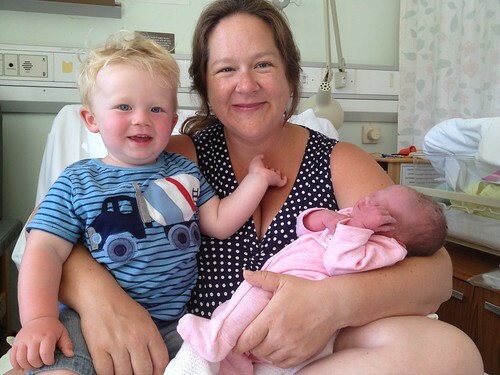 The Little Mister’s delivery was 4 hours and The Little Miss’ was 2 and a quarter hours. If they halve each time I don’t think we will be going for any more!! The Mister and I love the first name and her middle two names were my Mum’s names. It makes me so happy to be able to honour and remember my wonderful Mum in this way, it makes me unendingly sad that I have to do it this way. Such a happy and wonderful day, if a little unexpected! This morning we went to do the Les Babouins de Torteval or the Scarecrows of Torteval Walk. 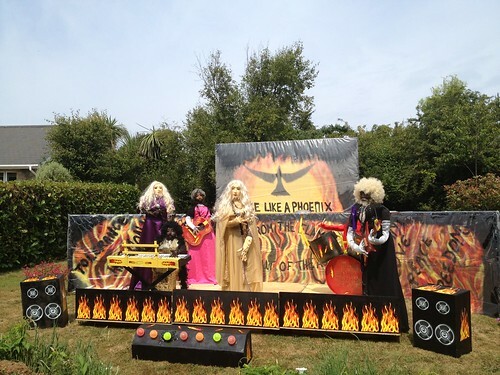 It is an annual event and there were over 50 scarecrow exhibits. Some were very clever and had a bit of a social and political comment on things that were happening in the States of Guernsey. This one really caught my eye because it was absolutely brilliant and they put so much work into it. It was a scarecrow tribute to Conchita Wurst who won Eurovision. Very well done. It has been a slightly crappy day today. I have been feeling really off-colour and my ankles are swollen and I feel knackered and just rubbishy. I am now fed up of being pregnant. The Mister has also been grumpy as he is tired too and it is a poor combination if we are both feeling crappy. 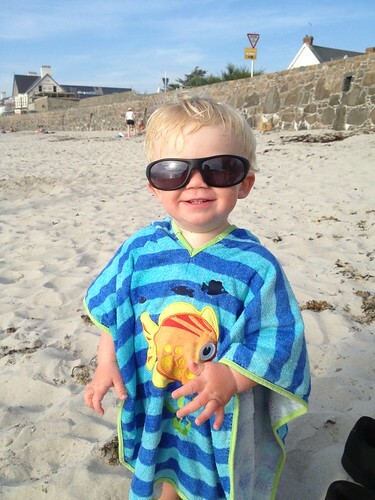 After we had given The Little Mister his tea we popped to the beach for a quick swim as the tide was almost high. It was gorgeous although the sea was cold. It certainly made us feel better and a bit less grumpy and The Little Mister had a lovely time running through the edge of the water. 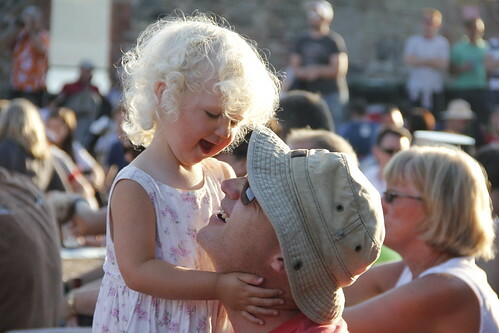 Tonight The Mister and The Little Mister and I went to Castle Cornet for one of the free music evenings that they have throughout the summer. They are brilliant nights out and they have three different stages with different types of music playing at each one. Last night two of my cousins band was playing. They are called Clameur de Haro and this was just their second gig. It was great fun and it was a gorgeous evening and nice to be out with some of the family. We took the chance to have a picnic tea and chill out. Such a great evening out in a beautiful venue. This photo is of my cousin Matthew and iis daughter. She was being so funny but I thought this was a lovely photo of the two of them. Funny to think that Matthew once had beautiful curly hair too!!! Today The Little Mister and I went to The Royal Guernsey Agricultural and Horticultural Society Annual Show. It was a lovely morning out (despite the rain shower!) and there was plenty to see with lots of gorgeous Guernsey cows, Golden Guernsey goats, sheep and horses. 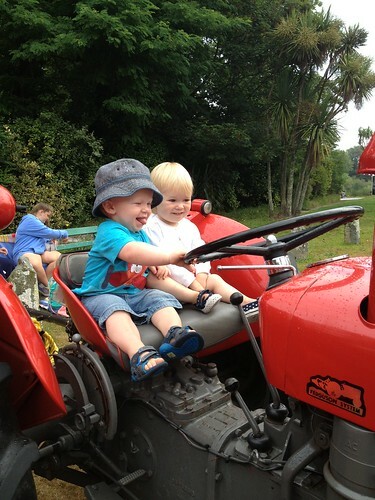 There was even a selection of vintage tractors and The Little Mister took his second-cousin Clara for a ride on one. Happy times. Another hot day although it was a little overcast this morning. The Little Mister and I took a walk to the park with Auntie Josie and her grand-daughter and my sister and the kids. 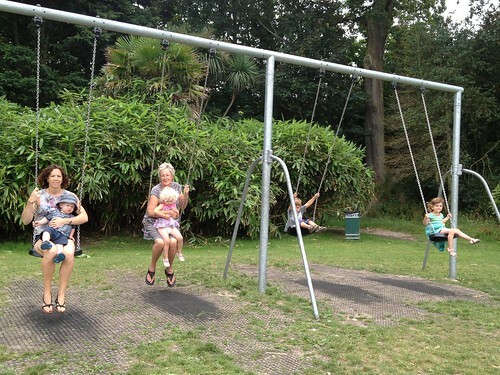 Here are all the kids, big and little playing on the swing. I am tired today. The weather doesn’t help and being 8 months pregnant when it is this warm is a little trying! Another stunningly gorgeous day today. 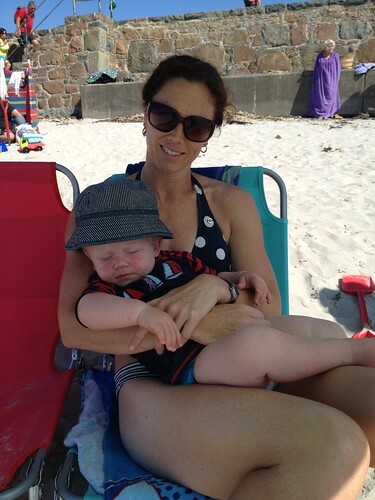 After I picked The Little Mister up from the childminder we went straight to another beach to see my sister and cousin and the kids. 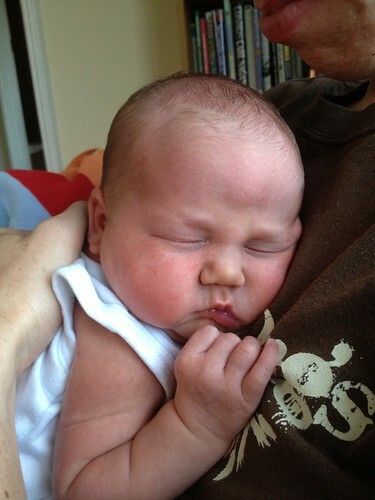 On the way there The Little Mister went to sleep which meant that Auntie Louise got to have a lovely cuddle with him. I am grateful for lots of things today. The beach, the island, my Dad and sister, my husband and son. The fact that we are all here together sharing our lives; the good bits and the bad.